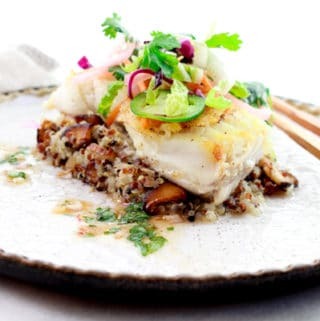 Last Updated: November 16, 2018 · Published: June 11, 2018 By: Asian Caucasian Leave a Comment This post may contain affiliate links or sponsored content. BEETS! In my younger years I was not a fan. Maybe because all I knew about beets was borscht soup, yuck! However, I’m loving beets now, all colors, all preparations. 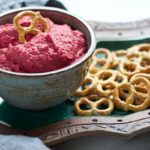 So, I’m sharing this amazing Easy Red Beet Hummus recipe that will become your party fave! It’s ridiculously simple to make and will have you dipping, double dipping, triple dipping, until there’s nothing left to dip! I cheated and used a package of Melilssa’s Organic Steamed Beets that saved a ton of time (or you can steam/roast your own beets). There aren’t that many ingredients in this tasty hummus: beets, garbanzo beans, tahina paste, lemon juice, garlic, cumin, and olive oil. That’s it peeps! 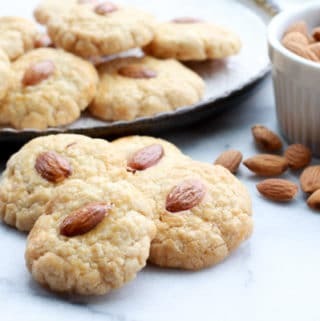 All ingredients are pureed in a food processor and ready to be dipped in under 30 minutes! 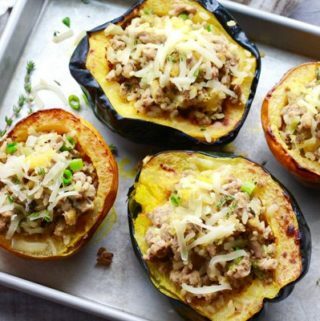 Serve with a side of pretzels, your favorite crackers, or fresh cut veggies! Do you love beets now? 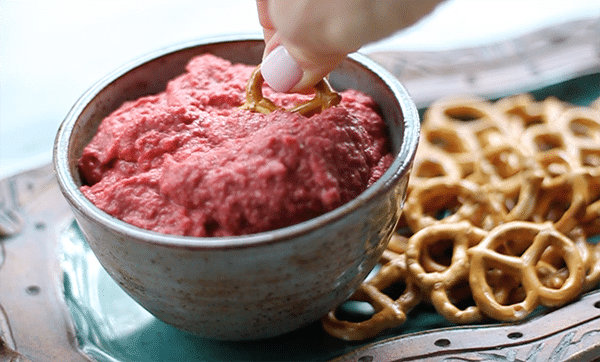 Look at that vibrant red color of these beets in this super tasty Red Beet Hummus dip! 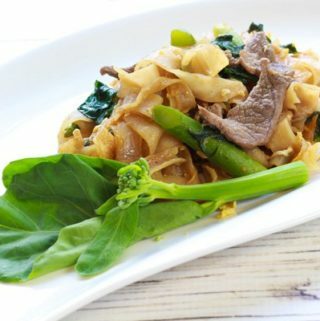 This recipe is a cinch to make with very few ingredients. I like to buy the beets already steamed in the package, such a time-saver! 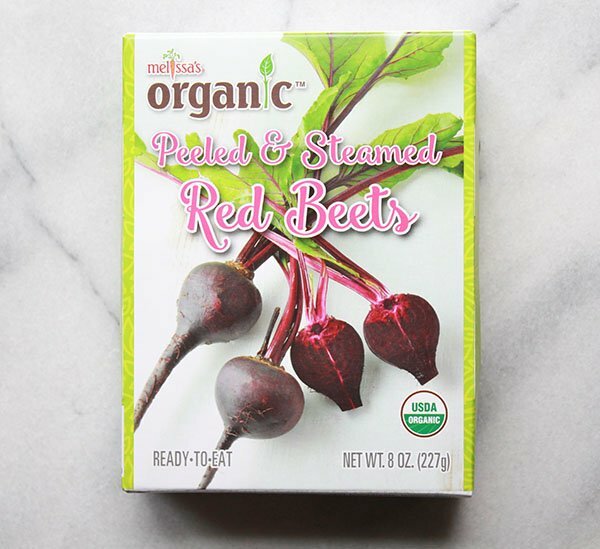 There are several places you can find these beets, like at Sprouts where I picked up this package of Melissa’s Organic steamed red beets. You can also snag a package of steamed baby beets at Trader Joe’s! Or, if you’re not lazy like me, you can peel some fresh red beets and either steam them or roast them. 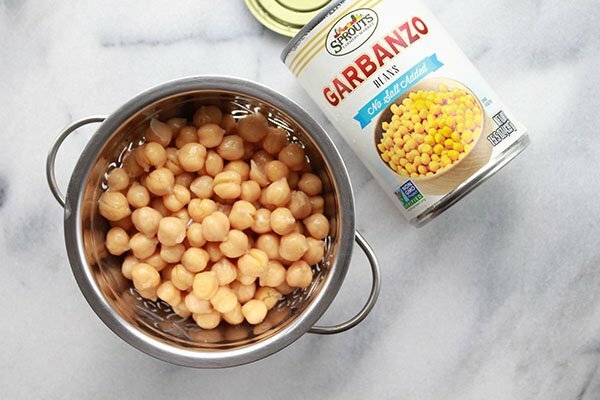 Any can of garbanzo beans (chickpeas) will do. Make sure to rinse and drain them well before adding to the food processor. Sometimes the starchy liquid in the can makes the hummus too thick, so it’s best to wash them off first. Of course, this is the main ingredient in most hummus recipes, but nothing will be as pretty as the red beet version! 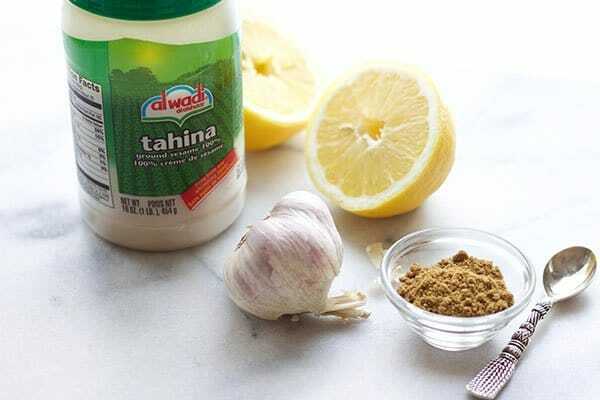 All of these ingredients make the flavors really pop in this hummus recipe like the addition of ground cumin, fresh lemon juice, garlic, and of course a bit of tahina paste. 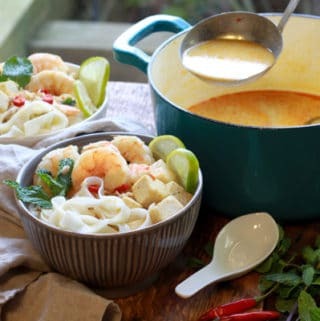 You can use tahini if you can’t find the tahina. Same thing, basically! 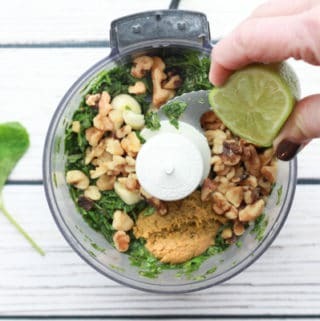 Puree all of the ingredients in your food processor (or a very good blender) so it’s smooth and creamy when dipped. You don’t really want any chunks of beets or garbanzo beans. Dip, dip, dip! 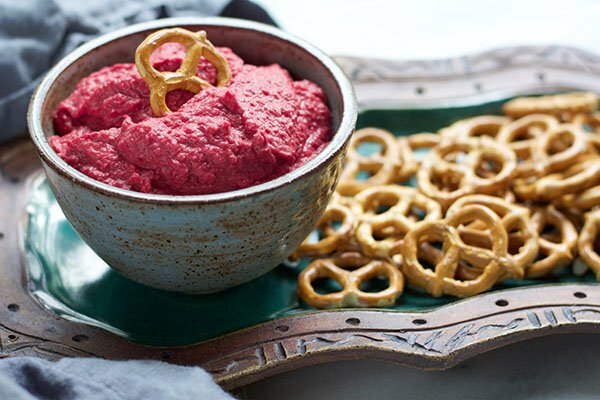 This Easy Red Beet Hummus works so well with just about anything for dipping. I used pretzels because that’s what was in my pantry. But find some good crackers, or even fresh-cut veggies for dipping. It’s all good! I know this dip will become your fave! 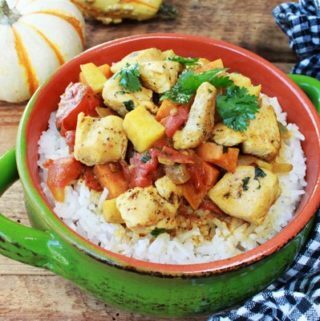 I’ve already made it several times for friends and family gatherings! 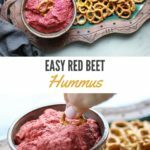 Easy Red Beet Hummus is a winner! 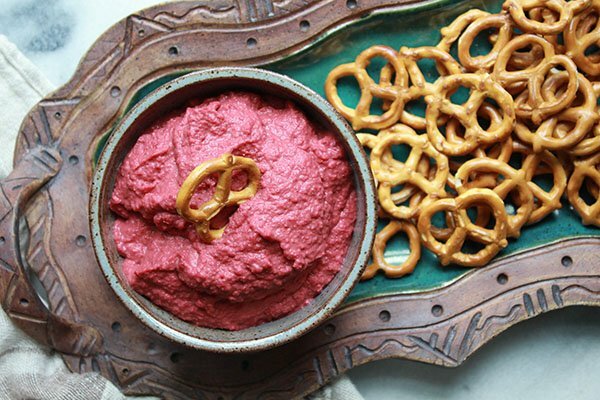 This beautiful and tasty Red Beet Hummus recipe will become your party fave! 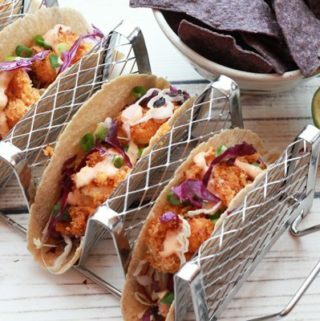 It’s so simple to make and will have you dipping, and double dipping, again and again! 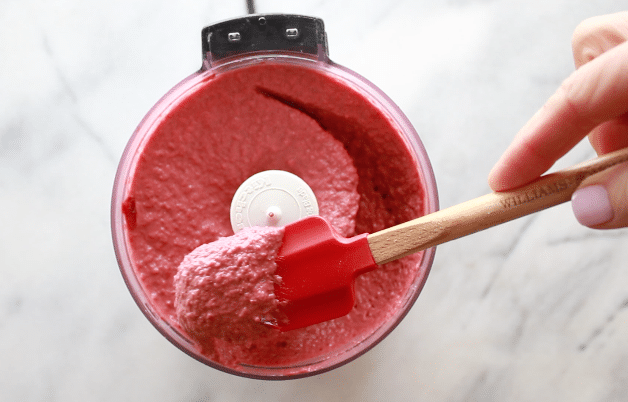 In a small food processor, add the beets and pulse until nearly smooth. Add in the garbanzo beans and tahina paste and pulse another 20 seconds. Add in the garlic, lemon juice, cumin, olive oil, and salt, and pulse until puréed and hummus is a creamy texture. Taste for seasoning. Drizzle with olive oil if so desired. 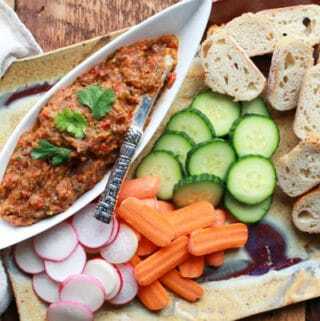 Serve hummus with pretzels or your favorite crackers or fresh cut veggies. 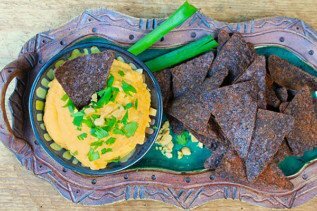 If you liked this recipe, try our Roasted Thai Butternut Squash Dip.